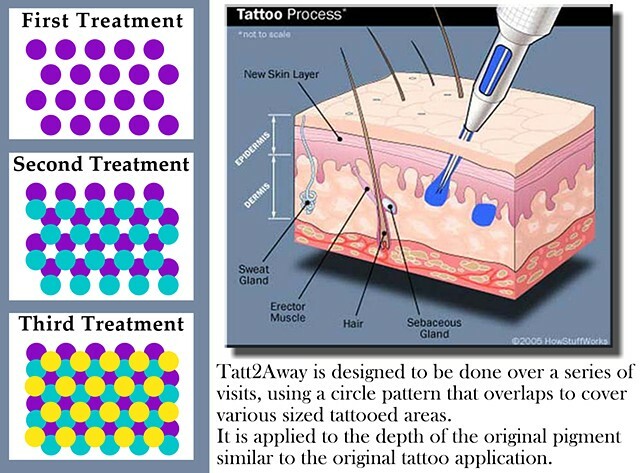 Tatt2Away treatments are designed to remove the pigmented areas of your tattoo in a series of visits, the number depending on the size of the design. For an average size tattoo, you will probably need four visits, but we will evaluate your individual needs during your initial consultation. A typical treatment session generally lasts between 30-60 minutes in length, during which time small circles are created over the surface of your tattoo. Spaces are purposely left between each circle for better healing results, and will be treated in subsequent sessions. The spacing strategy has proven to help with the over all healing process and minimizes the chance of scarring. Time between treatments is a minimum of 8 weeks, with a 4 week check up in between.